A family was saying goodbye to their child, experiencing the most unimaginable pain I can ever think of. And at the same time, our family was preparing to receive the 2nd most precious gift we could ever imagine. April, 2011, post transplant. A whole heart. The 1st most precious gift, of course, was given to us 2000-ish years ago, when a Daddy, God, allowed his son to die, willingly, in order to give the hope of eternal life to all of us. Our pastor yesterday talked about “hitting walls” in our life, the ultimate wall being our own mortality. A very fitting sermon, given that a year prior to the day, I had hit my own wall. Really, I hit small walls each and every day. but that particular day had been especially hard for me. That night, I laid in bed and gave up. Literally. I didn’t know how I was going to get up out of bed the next day. I’d been going and taking step after step for eight very. long. months. Sometimes I think we “think” we hit walls… but the walls are flimsy and if we push them hard enough, we get through them the next day. And other times, there are real, immovable walls. And at about 4 a.m. on April 9th, I received the phone call that knocked down that wall. There was a heart for Annabelle. Celebrating heart day is bittersweet, though. On one hand, I want to hang streamers and balloons and have a big-bang of a party. On the other hand, I almost can’t bring myself to do it, as I know that the shattering of my wall only came about at the expense of the shattering of another parent’s heart. Still, I am thankful. Thankful that God allowed something so horrific to bring life to my Annabelle. That we’ve made it this last year, through possible rejection, heart failure, another open heart surgery, chronic lung disease, paralyzed vocal chords, paralyzed diaphragms, 2 heart caths, RSV, a few other colds, failure to thrive, a broken leg, and the moment last July when we came moments away from losing our Annabelle. She’s learned to roll over and crawl and stand and cruise. While she isn’t eating yet, she’s not 100% opposed to learning. She’s putting things “in” containers, and we *think* is starting to say Momma and actually mean it some of the time! We’ve gone from 20 meds a day, 5x a day, to 9 meds a day, 2x a day. We’ve gone from a liter of oxygen 24/7 to 1/16th of a liter at night only when needed. And she’s gotten glasses this year too! It hasn’t been an easy year, to say the least. The ups and downs, while not quite as wild as the year before, were still very real, and very scary. And very exhausting. But we made it. With God’s strength. Annabelle’s alive and thriving. We’re more thankful than we could ever, ever convey. While her physical life was saved, I was reminded this weekend that I still have a big responsibility as a mother, no only to help her grow physically (which is a BIG deal) but to teach her about Jesus, about his love so that she gives her spiritual heart over to Jesus. Because while surgeon’s can transplant our physical hearts when needed, which is a HUGE miracle… a bigger miracle is how God can take our sin-filled heart and made it as good as new. 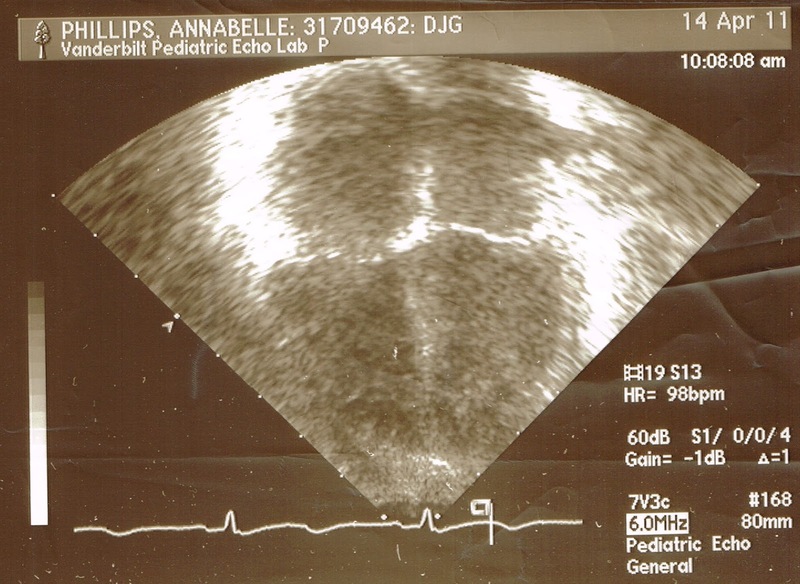 I included the pictures of her heart (see above) from echo’s pre-transplant and post-transplant. I remember vividly the first echo post transplant. While I watched, I almost stopped breathing myself when they came to the picture that you see above. Funny, I asked a few months ago for a picture of her original heart, so I could compare and post them today. And as much as I’m used to seeing heart pictures now, I still have a hard time figuring out what is what on that. So yeah, don’t ask me to give you a guided tour of the first pic. I have no clue! But… it’s supposed to be the same view as the second, I do know that. Oh, and I can’t wrap up a heart day/Easter post without posting Easter Pictures!!! Happy Easter Everyone!!!! Adorable Annabelle! 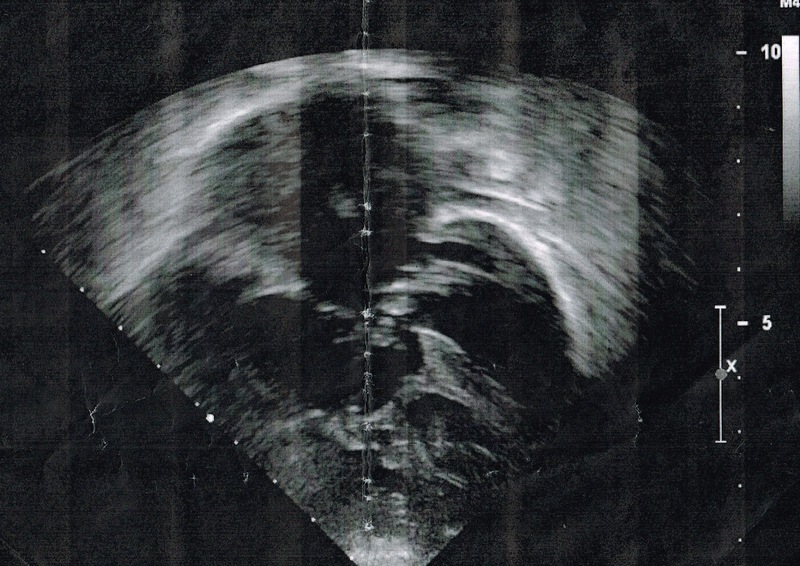 Easter 2011 – New heart… still in the hospital… yucky bruises!! I love Easter… but not this bow! Mom, is this an egg?? I can’t tell… the sun is blinding me! Now THESE are some eggs, people! Let the eating of plastic commence! Mom! Mom! I found one in this really…. prickly… tree…. I have eggs… and I’m adorable! What combination! Jesus… please help me find some eggs.. pretty please! Thank you, Jesus, for your gift of life. And thank you, Jesus, for another year. Happy Heart Day Annabelle. Mommy loves you. And to a special family out there… I’m thinking of you today. Praying for you. Yesterday at prayer request time at church someone mentioned the six-month-old son of one of her friends who was just put on the list due to an illness that affected his heart. She actually said, "My friend's baby is in the position that Valerie's friend's baby, Baby Annabelle, was in last year. He is waiting for a heart." I was struck by that for a few reasons. 1) Someone actually paid attention to my months and months of prayer requests! LOL! 2) Another baby needing a heart. *sigh* 3) Last year. Wow! It really has been a year. Most importantly, though, 4) Annabelle has been permanently etched into the hearts and minds of SO MANY people because of this struggle. Through all of that, our Lord gets His glory at the mention of Annabelle's new heart and her wait and her illness. Lovely post on such sn important day. Beautiful. Isn't it amazing how God blesses us…so often when we've hit a wall? So true. I have been counting down the days to today…the 1 Year Anniversary! I am so proud of Miss Annabelle (and all of her family)!! This is so beautiful! Happy anniversary, Annabelle! I loved seeing the pics of all your girls. What a contrast to see her out there playing with the eggs. You are a great mom, Krista! Wow, a year?? Blows me away and WHAT a difference a year makes. Praise Jesus! What a year it's been for you and your family, but look how far you've come. I love seeing the pictures of a thriving Annabelle and her lovely sisters. Happy heart anniversary, Annabelle! Wow, what a year it has been. Those photos are so fun, btw. I can't believe how much all your girls have grown! So glad for y'all. Thank You, Father, for continuing to preserve little Annabelle — and for helping her blossom! This totally made me cry. Happy heart day to Annabelle. Here's to another year. Loved your beautiful story and your lovely Easter photos! Shannon… you can try krista@ before that and it should work:-) If you still can't get it to work, there is a link on my About Krista tab on this site!